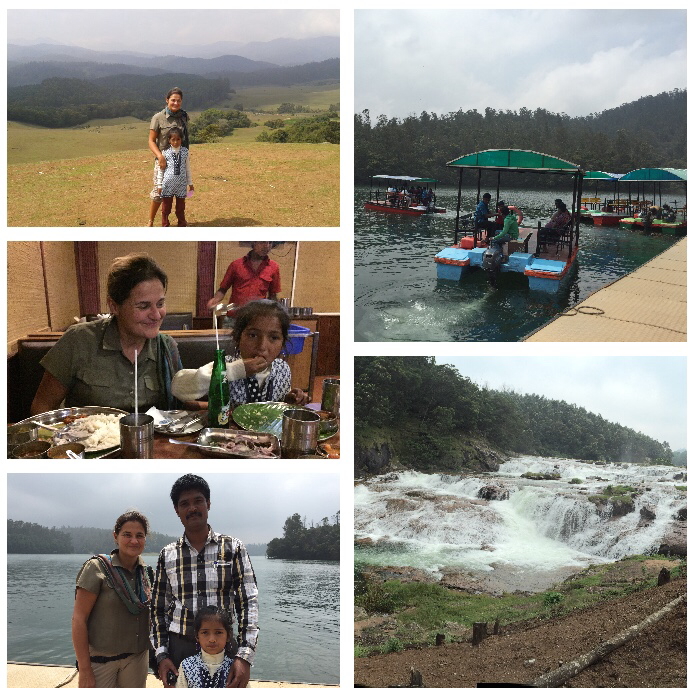 7weeks in India – Indian hospitality and Sanjana, my little ‘tooli’ – Go India, go future! In the evening, when I arrive at the hotel – after the first day in Ooty – he is waiting for me. A tall man, nicely dressed and with a friendly smile on his face: Rajesh, the hotel director. “Ma’m, how was your day? …. Is everything ok with the room?… Do you like a tea or coffee?” As far as I know Rajesh is a good friend of the housekeeper where I am staying most of the 7weeks. A 4 hours drive away. The tea arrives – or better: two. One for me and one for him. Rajesh sits together with me with a huge book and a map that shows all sightseeing highlights here in Ooty and surroundings? “You have seen the Roses garden, the city market, the Botanic Garden? Taken the train to Coonor? That’s good,”he says. “But what about the surroundings? You have to see them before leaving …! You can’t leave tomorrow morning. Just stay for a few hours more.” He tells about his family, and late marriage ( just married at 32), his two children, the land he has bought for setting up his own hotel outside the city, the house for the family he has built there and his future plans. “I wanted to talk with you already in the morning, but when I arrived you had already left”, he tells me. During the last hour I got offered additional two teas, a chocolate bar (a speciality in Ooty), a huge book on all Tamil sightseeing places, train and bus connections, distance table … And a very interesting conversation. When we finish to talk, plans are done: Tomorrow he will come with me to show the really nice places in the surroundings. And he will bring his daughter. The friend of a friend (or better my housekeeper’s friend will take care of me to make my stay as pleasant and interesting as possible. Just because of hospitality! Indeed, the next morning at 9am he is waiting when I climb down the stairs – with his 7 years old daughter, Sanjana. She and her brother visit the international school here, so she understands already English, although she is very quiet. It is a special day for her – an excursion with her Dad and an unknown lady – to see lakes and horses, waterfalls and exciting landscapes. During the drive she listens carefully. A 40 students are in her class, school starts at 8.30 to 5pm. Math is her preferred subject, she explains. A clever and really nice girl! On one of the top’s of the hills I buy some bubbles for Sanjana. She is happy and we enjoy all together the bubbles flying in the air – bubbles with an unforgettable view on a breathtaking mountain chain in the background. When we walk to the big waterfalls, Sanjana takes my hand. “Tooli irikkural”, she says. A word that means friend amongst women. I think I have to come back, one day … to visit them again. Maybe to the rural areas where Rajesh will have become a proud owner of a nice hotel.